There is nothing like a discussion about behaviour and discipline, either in the staff room or in the classroom, to get people talking with passion, intensity and all too often from totally different perspectives. 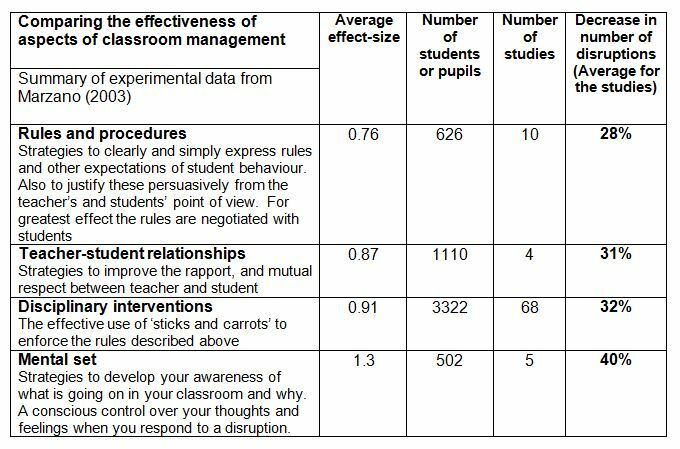 Staff’s “obsession” with discipline, identified by Canavan (2003) above, is possibly borne out of a reality in which the level of discipline, in the school or class room, has arguably the biggest impact on the quality of our daily lives, working environment and well-being. It is often cited as a reason why teachers, young and old, decide to quit the profession. Students may well feel the same about the impact of behaviour on their working day. Do you have a “Keep ‘Em In” or a “Kick ‘Em Out” type of approach to School Discipline? What’s important is that we clearly think through our belief system about school discipline and looked at some research about what actually works. Over time this research can be contextualised alongside what works in the classroom for “me and my students”. As Jason Bangbala once said, “You need to avoid a guts to gob reaction” and this blog is an attempt to move us more towards a “brains to action” response. 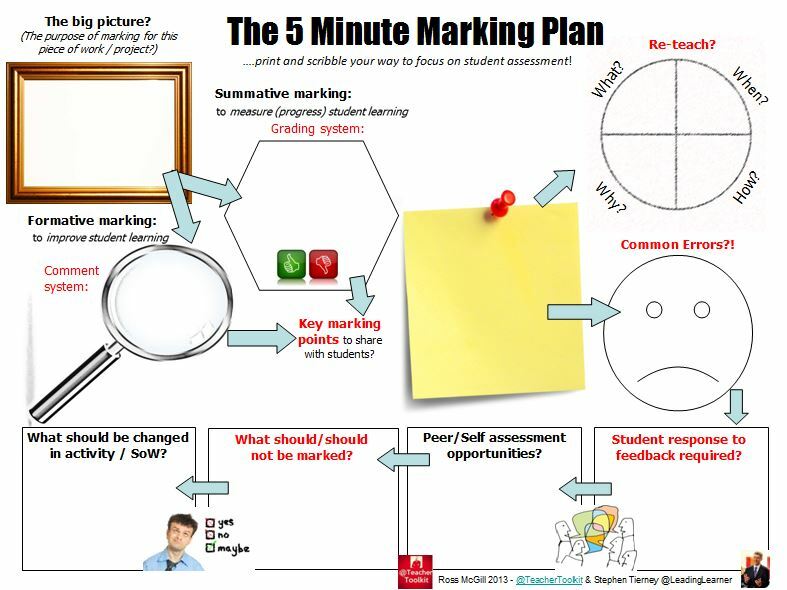 A number of the graphics and the information below have been used with the kind permission of Geoff Petty and are taken from his book, Evidence Based Teaching (2009), which I read when it was first published. Itis well worth reading. His book uses the research of Robert Marzano et al (2003) “Classroom Management that Works”. Acknowledgement: Petty, G (2009), Evidence Based Teaching: A Practical Approach. Nelson Thornes. Without rules communities can descend into chaos and anarchy with the poorest and weakest in a community (society) becoming the most damaged and disadvantaged. Coming up with school or class room rules that try to take account of every eventuality can become self-defeating, as no-one can remember all the rules. 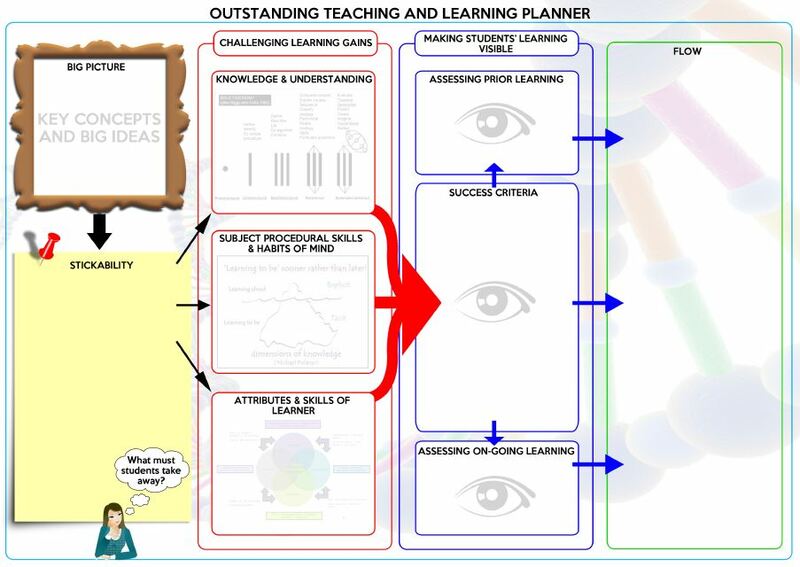 A parent recently reminded me we use to have a couple of pages of rules in students’ planners which no-one read. For daily operating we need a few agreed and understood rules, possibly between five to seven, that can be used to give direction to a way of living and working together. Our challenge is not simply to impose rules but rather to bring each person to a level of self-control and self-discipline that allows them to be a full, supportive and enriching member of the class and wider community. It’s interesting to note the basis of laws across Europe and other parts of the World find their origin in the Ten Commandments (these were changed to just two in the New Testament expressed in positive language). The Ten Commandments are a call to a relationship and signpost a direction of travel. They cannot hope to nor did they intend to cover every instance of human behaviour but are a set of guiding principles. For example, there isn’t a commandment banning pulling your brother’s or sister’s hair or giving them a quick dig in the ribs if they annoy you. However, the spirit that goes beyond the letter of the law requires us to treat our brothers and sisters with respect and love and this is the key to their understanding. This thinking is useful for us in the classroom as we set rules and as we shall see later the development of “right” relationships is key to managing behaviour. Classroom Procedures are usually developed by a teacher over time, however, explicitly thinking about procedures, for the start and end of lessons or during transitions from one activity to another, can help keep a classroom calm and ordered. 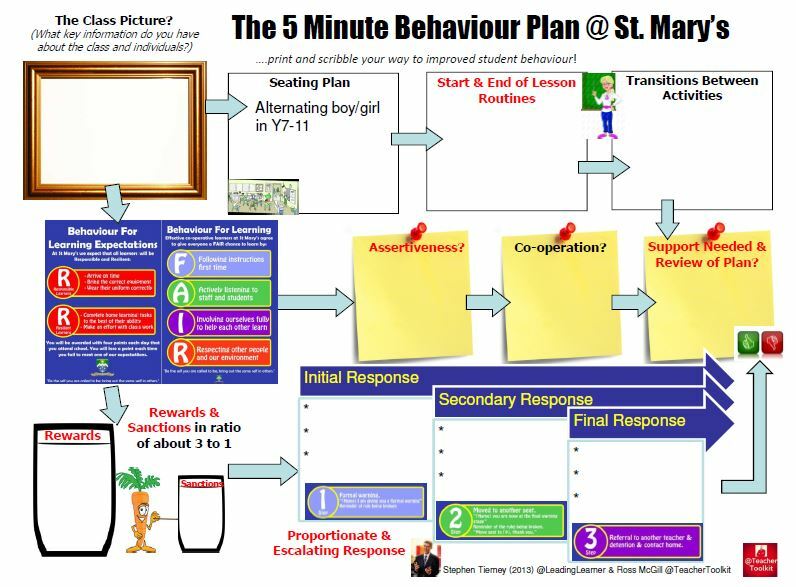 Whether it is handing out books, equipment or putting things away, developing standard routines that students quickly become familiar with increases the efficient use of time and reduces the mini-moments of disorder that may occur in lessons. “Don’t smile until Christmas”, is the advice often given to newly qualified teachers. However, the flip side of this advice, “Start smiling before Christmas”, is not so often given to more experienced colleagues. Both have a seed of truth and usefulness in building student-teacher relationships. For newly qualified teachers the generalisation and stereotype is that there tends to be too much co-operation and a lack of assertiveness within the classroom, sometimes confusing a friendly approach with wanting to be a friend. This is the essence of the advice to “Not smile until Christmas” in an attempt to increase dominance in the classroom. However, it is important to note that, as a generalisation, somewhere between six to ten years into teaching a number of teachers lose their sense of care and co-operation in class tending towards a “blitzkrieg” approach that is too dominant and damages relationships. The graphic below gives some depth to the “fair but firm” discipline often written about in letters of application and talked about in interviews. 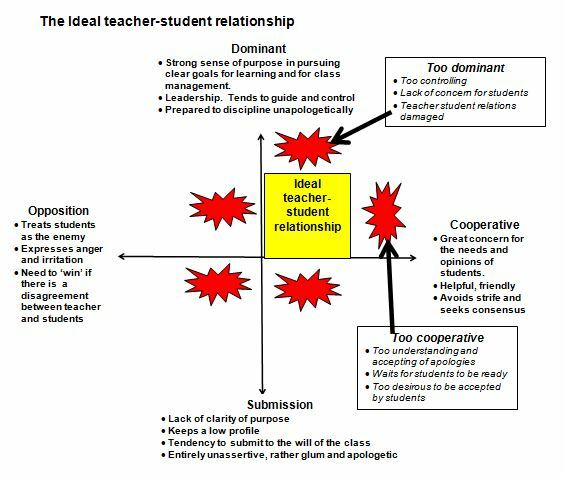 The two dimensions of dominance and co-operation are held in tension so that a caring but assertive approach is used within the classroom. There must be a balance between a teacher’s control of a class and the co-operation needed to form positive relationships between teachers and students. “Stephen, listen when I am talking … <eye contact, small pause> … Thank you”. 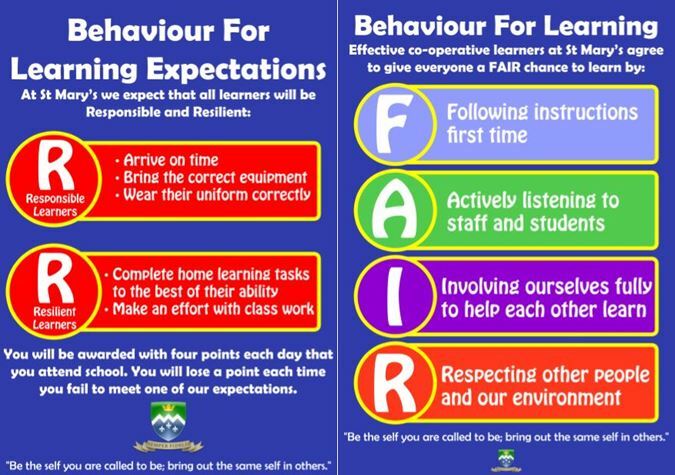 Consistently and assertively using a simple range of proportionate and escalating responses to poor behaviour. 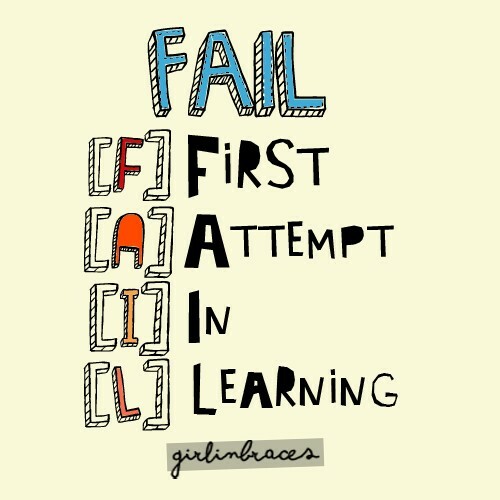 Whilst it can be very hard work, take care not to pass issues or students on too early in any disciplinary process – when you “pass on” you are essentially saying to the student, “I can’t cope but this person can!” Follow up and follow through as much as possible as the benefits in the medium to long term are massive. Taking a general and genuine, but not intrusive, interest in students’ lives and interests. What is the talent of each of the students in your class/form – what do they excel at? As an aside, it is interesting to note that Hattie’s work shows strong teacher-student relationships as the 11th most important factor in raising achievement. Students do better academically when the relationships in class are right. This is essentially about using “carrots and sticks”. What Marzano (2003) found in his meta-analysis was that appropriate use of sanctions and rewards had a greater impact than using neither or one but not the other. Just using rewards had a bigger impact than just using sanction but this was not as powerful as using both. The use of sanctions is important to understand – it is the consistency with which they are applied and the inevitability that it will happen much more than the severity that has impact. In fact in Marzano’s work he writes about “mild punishments”. It is important to be proportionate in your response and then follow up and follow through. There are numerous intervention strategies that can be used in the classroom to get students back on track. The use of rewards is more important than sanctions, in improving behaviour, with verbal praise, points, stickers, merits, positive notes in books/planners, phone calls home etc. being all fairly standard responses in many classrooms. The addition of certificates, badges, golden time, gifts, vouchers and reward trips often occur at a departmental, phase, faculty or whole school level. 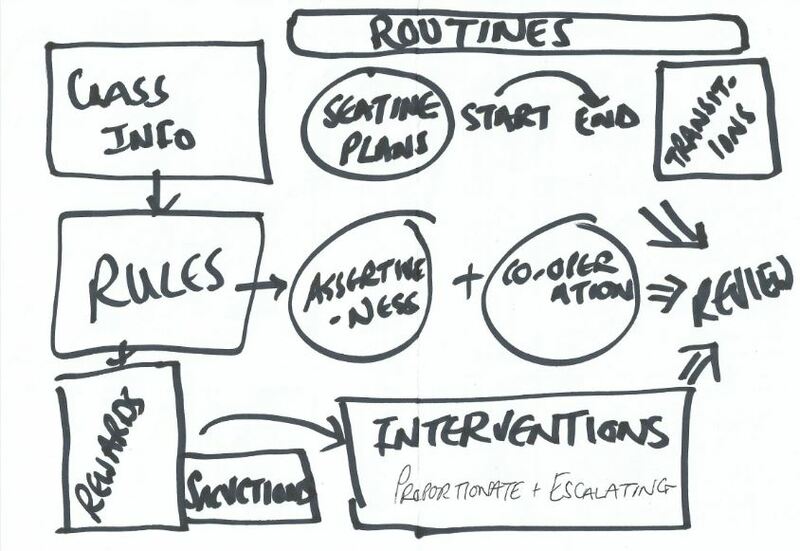 Marzano (2003) identifies the biggest impact on reducing disruptive incidents as the right “Mental Set” which he defines as a conscious control over your thoughts and feelings when you respond to a disruption alongside strategies to develop your awareness of what is going on in your classroom and why – what Marzano refers to as “withitness”. “Withitness” is about being present and being a presence. Developing the peripheral vision needed to successfully manage a group of thirty students is an important part of behaviour management. 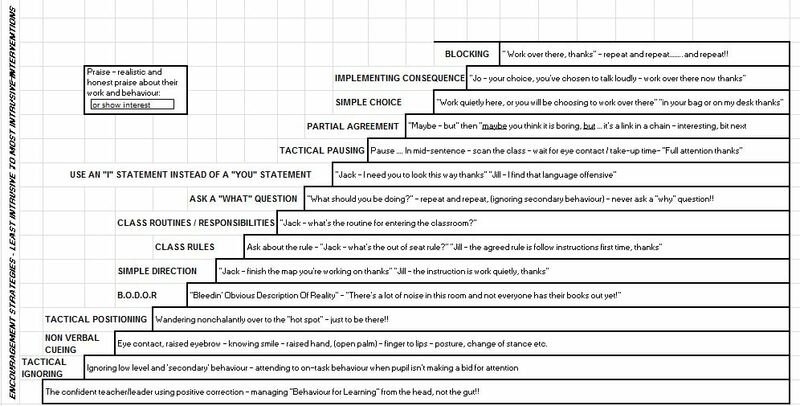 Scanning the classroom whilst teaching and intervening immediately, using the minimal possible intervention to resolve the issue, limits the opportunity for things to spiral out of control. Moving about the classroom, around the perimeter whenever possible, allows you to have a physical presence in a room whilst ensuring all students remain in view. Take care when working with an individual student that you don’t end up with your back to half the class. Emotional Objectivity is a real challenge particularly when you are in the “eye of the storm” and a student is behaving badly or being outright offensive. Keeping calm, remaining assertive and managing the situation is crucial. You’d be surprised how many students in the class think you are doing a great job and handling a difficult situation well – remember to thank the class for their co-operation during the difficult incident if their behaviour warrants it. The misbehaviour isn’t personal. Putting this all together in a picture is a challenge (see above) but doing it in the classroom is even more challenging. Some people will find some aspects of behaviour management come very naturally and easily to them and other parts are more challenging. It is worth taking an aspect that you wish to improve: focus on it for half a term or a term, practice it and hone it until it becomes second nature. Canavan, N. (2003). The Culture and Ethos Process: Releasing the Future of the CatholicSchool. In: Prendergast, N. and Monahan, L. Reimagining the Catholic School. Dublin: Veritas Publications. p. 168-182. Petty, G (2009), Evidence Based Teaching: A Practical Approach. Nelson Thornes. « A Silver Lining to the PRP Cloud? 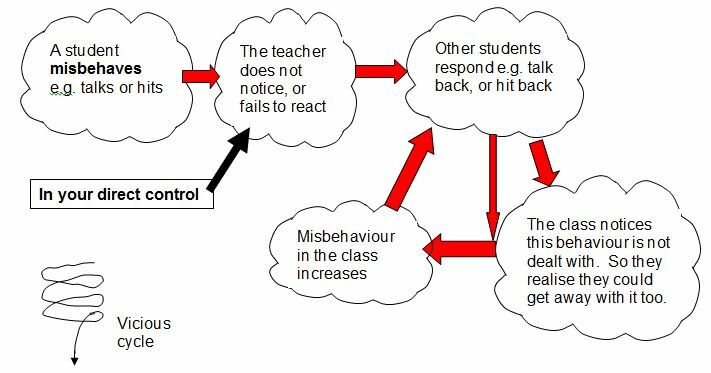 I like your diagram to show teacher behaviours to deal with disruption, would be good if ‘kick em out teachers’ could have a kind of plan in their minds for different situations. I suppose that is experience the diagram would Lend well to a 5 min plan! Thanks for the comment Claire – how did you guess. Working with a well known blogger and tweeter to finalise details. Enjoyed this, Stephen – thank you. And I was really struck when watching ‘Educating Essex’ in 2011 – Stephen Drew, the deputy, was dealing with a particularly difficult incident (a girl had accused him of grabbing her. He hadn’t). When it was all dealt with and she was back in school he behaved as if it had never happened, and I remember him saying, ‘Kids lie. Adults lie. Get over it,’ (or similar). This struck me as brilliant – I’ve known staff who have NEVER ‘got over’/forgotten/forgiven – especially if a child has accused them of something. It takes huge effort, but I really do think we have to be able to deal with something, move on and not hold it against the child in our future dealings with them. Thanks for the comment and I know this dilemma, sadly, too well. It is the balance of the “I” and “we” – trying to do the best for each individual whilst ensuring the community as a whole isn’t damaged too much. The link to the newspaper article was really useful as I hadn’t seen it before. The quote below I think is Jewish in origin (apologies if I’ve got that wrong) but is a real challenge of how we hold closest to our heart the most difficult and damaged young people we work with – there’s not much in the accountability measures that helps you with this, they are much more likely to make it even more difficult. “But how can that be?” the eager disciple asked. I sense this will continue to challenge us all throughout our careers and in the end we can but do our best. Thanks for the blog. I’m just trying to finish a study on behaviour and much of it rang true. The most overwhelming difference seems to be the relationship between teacher and pupil which can so often be the cause of problems in the classroom. Some teachers find it hard to build respectful relationships with kids, often through no faul of there own. The guidance on how to help teachers with this isn’t as thorough as other areas of classroom management so this is very interesting. Since fining this blog, (and your other one) I have found myself reflecting on my own work and the leadership and vision I set out. It has led to some uncomfortable moments but mostly it has led to a sense of relief. I am very grateful for your blogs as they afford a chance to think again. If it’s any help since writing the blogs I’ve reflected on my own practice a lot as well – it’s one of the real benefits of blogging. I’m glad you’ve found them useful. Saw a great quote the other day, “Whatever your past has been, your future is spotless.” I’m delighted that tomorrow I can start again and just keep doing my best, learning from both successes and failures. This model can be used in our everyday lives. It is a great model for obtaining discipline in our schools therefore causing the user to reflect on his action so that the schools approach to discipline can change. It’s amazing how a lot if what has been written seems common sense but as others have said, the relationship or lack of (sometimes), between teacher and pupil can mask this. We can all learn new things when it comes to behaviour management as no two individuals are the same so, what works with one may not with another. I like learning new ways, observing other teachers, taking feedback on my lessons, reading and observing the children, we may be teachers but we shouldn’t forget we are also still learners. Reblogged this on Mainstream to a PRU and back…. What q fantastic post. 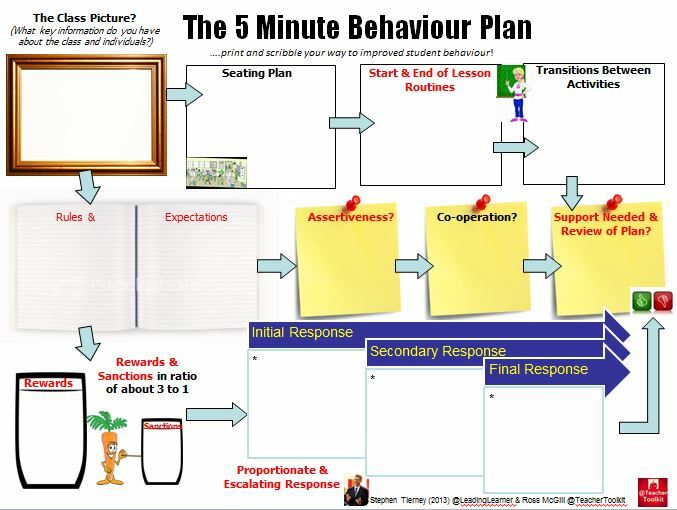 I’ve just delivered a staff meeting on behaviour tonight and it’s nice to read similar ideas. Your writing style is clear and concise and a pleasure to read. Good job! Really enjoyed this blog Stephen. 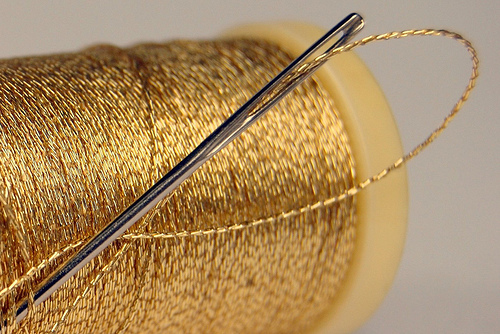 When I have time to collect my thoughts, I want to lead a school where Unconditional Positive Regard is the thread throughout the school for everyone. Certain incidents/families/staff etc sometimes challenge this however and it takes strength to keep to your morals! Every child needs a champion and whilst it can be very challenging to have certain children in our class/lessons, we should always remember what it must be like to BE that child.